Our Anti Allergy Bed Bug Waterproof zippered mattress encasement protects your investment. No more worrying about accidents in bed, baby blowouts, beverage spills, and pet paws. Our machine washable bed bug Anti becterial cover is easy for you to install. Our Bed Bug mattress cover is sized to fit standard mattresses and zips up nice and tight, it makes your mattress water and bed bug proof. Your mattress with last longer with our Bed Bug hypoallergenic mattress protector which protects the manufacturer’s warranty. Your mattress cover has a Lifetime Warranty against manufacture defects! You will sleep better when you aren't exposed to bed bugs, allergens, dust mites, and germs. No more waking up sneezing with a runny nose and itchy red eyes from allergens in your mattress. Our Bed Bug mattress cover will let you sleep well and undisturbed on our thin, breathable mattress cover that sleeps cool. It will not change the feel of your mattress or bedding. KEEPS YOUR MATTRESS DRY AND CLEAN - Our Zippered Anti Allergy Bed Bug Waterproof zippered mattress encasement protects your investment. No more worrying about accidents in bed, baby blowouts, beverage spills, and pet paws. EASY TO MAKE YOUR BED, SIMPLE TO WASH - Our Luxury machine washable Anti Bacterial bed bug cover is easy for you to install. 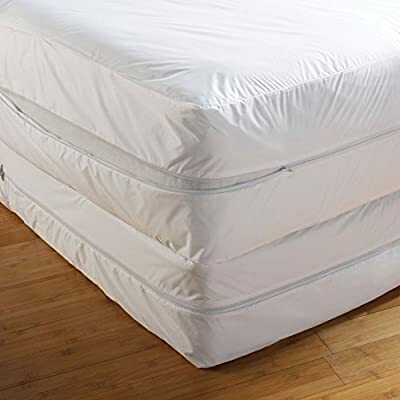 Our Protective Bed Bug mattress cover is sized to fit standard mattresses and zips up nice and tight, it makes your mattress water and bed bug proof. SAVE MONEY & PRESERVE YOUR MATTRESS LIFE - Your mattress with last longer with our Bed Bug hypoallergenic mattress protector which protects the manufacturer's warranty. Your mattress cover has a Lifetime Warranty against manufacture defects! REDUCES ALLERGY SYMPTOMS - You will sleep better when you aren't exposed to bed bugs, allergens, dust mites, and germs. No more waking up sneezing with a runny nose and itchy red eyes from allergens in your mattress. 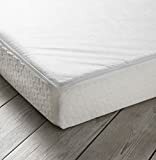 NO NOISY OR CRINKLY SOUNDS - Our Luxury protective Bed Bug mattress cover with zip will let you sleep well and undisturbed on our thin, breathable mattress cover that sleeps cool. It will not change the feel of your mattress or bedding.